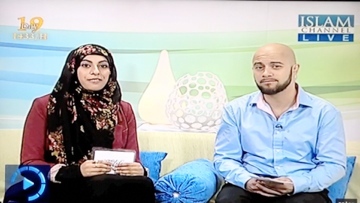 In Ramadan 2012, Kamal Ali, founder of Hajj Safe, was interviewed on the Islam Channel by Rahim Jung and Hajara Yasmin. The interviewees were impressed with the product, and it provided an opportunity to discuss the concept behind Hajj Safe, as well as carry out a live demonstration of its durability. The first thing that Kamal was asked about is the surprising fact that people actually steal from others at Islam’s holiest sights. Kamal explained that we should not judge according to the status that Allah has afforded us; some of these people might be in desperate situations so we shouldn’t judge. Later on in the interview, Kamal explained that a friend of his had called and described how he had been pickpocketed, so with his background in design, Kamal decided to develop something that would help stop this happening to pilgrims. The effectiveness of the belt how it came to be produced was discussed. Kamal explained that it took two years to be developed and around fifty different prototypes were produced in different sizes, styles and colours, and with a variety of wires. He pointed out that Hajj Safe appreciates customer feedback and where possible incorporates this into future products and designs. The unique design of the Hajj Safe waist bag makes it almost impossible for anyone to cut through the strap, which is an important feature as many people have had their bags stolen by thieves cutting through the strap around the back, and the person does not notice due to the pressing crowds. Rahim and Hajara both attempted to cut through the strap using a pair of scissors and full force- the scissors actually started to bend! Rahim said that the waist bag would have been useful when he was backpacking around Europe, as people were having their bags cut from behind when asleep in a hostel in Paris. This is no doubt why the first shipment of waist bags sold out within two weeks. As explained in the interview, it is possible to buy Hajj Safe products directly from the website, or from stockists around the world. Take a look at the interview yourself on Youtube to see the effectiveness of the waist bag - View Here.